When I was a teenager I absolutely loved the Willard Price books. They were all called Something Adventure, eg Whale Adventure, Volcano Adventure, and South Sea Adventure (to name but three). They were about two teenage brothers who travelled the world collecting exotic animals for their father's zoo, having exciting exploits and encountering loathsome villains on the way. Well today (Saturday 15 October) we had our own animal adventure. 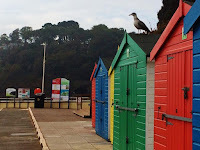 It all started as we were walking down to a remote beach in Torquay. 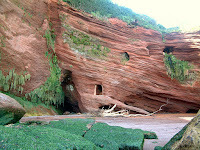 As we slipped and slid down the uneven path, we heard an eerie wail/howl which echoed around the cliffs. 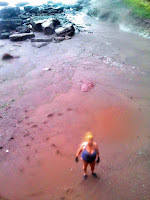 Ju thought it might be a seal, and sure enough, as we got closer to the beach, we saw two in the shallows. Down in the cove, we sat down at a distance to watch them. 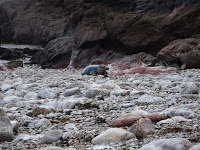 One of the seals started to hightail it up the beach (as far as a seal can high tail it - it was rather a slow and inelegant process), with, it seemed, quite a sense of urgency. As she neared the high water mark we suddenly realised there was a white fluffy pup up there. It was brilliantly camouflaged. 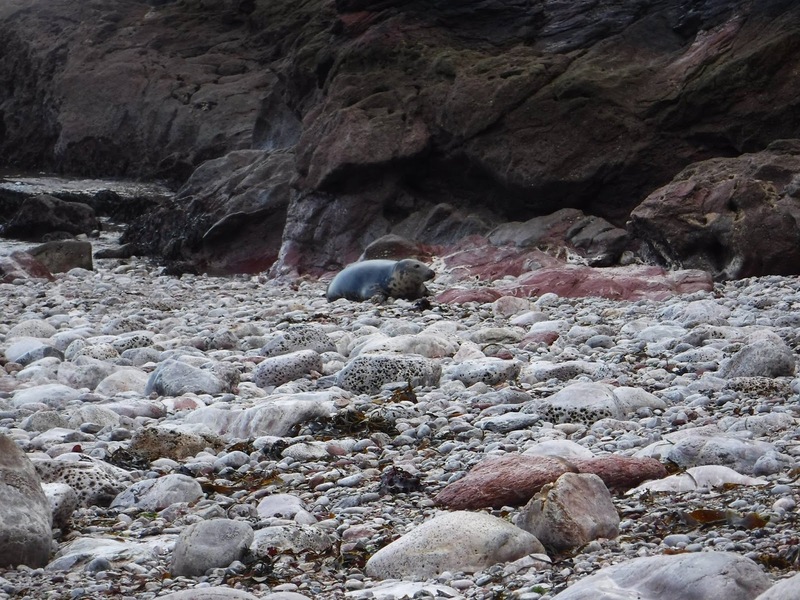 Later, when we returned after exploring the rest of the beach, the mum and the pup had come down to the water's edge. The pup hauled itself into a rock pool where it repeatedly dipped its head in and out - I guess it was experimenting with the water. 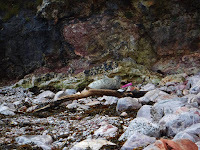 We felt so privileged to have seen this seal family. 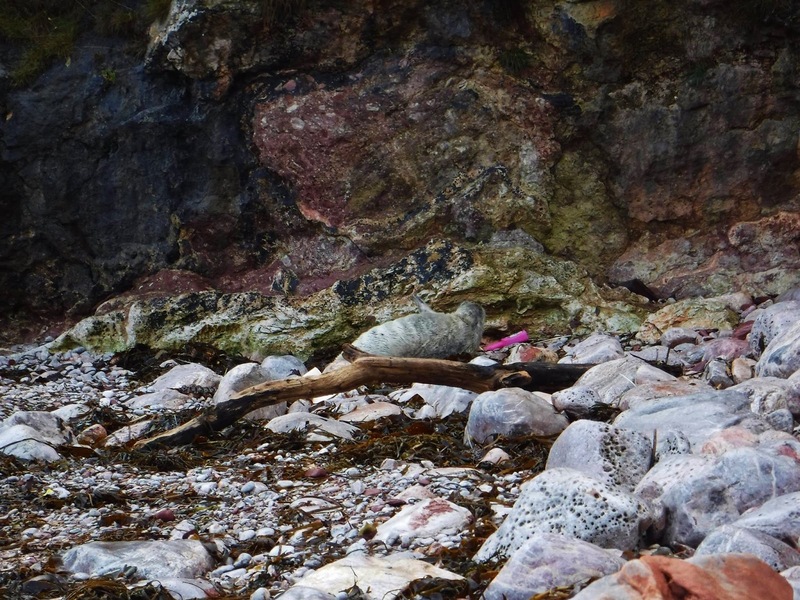 Can you spot the 3 seals? 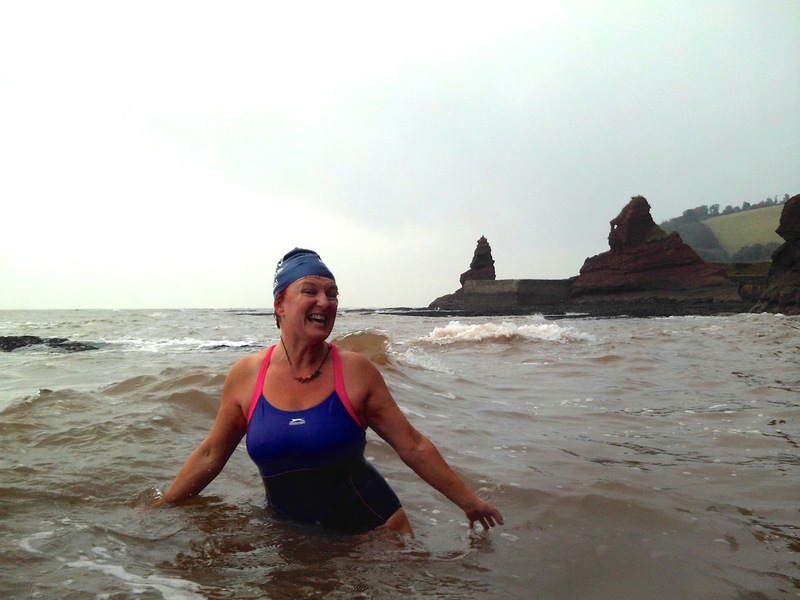 There was a last-minute post on Facebook from Gilly that she was swimming at Coryton Cove in Dawlish. I leapt in the car and decided to join her and Charlotte and Michelle who also came along. 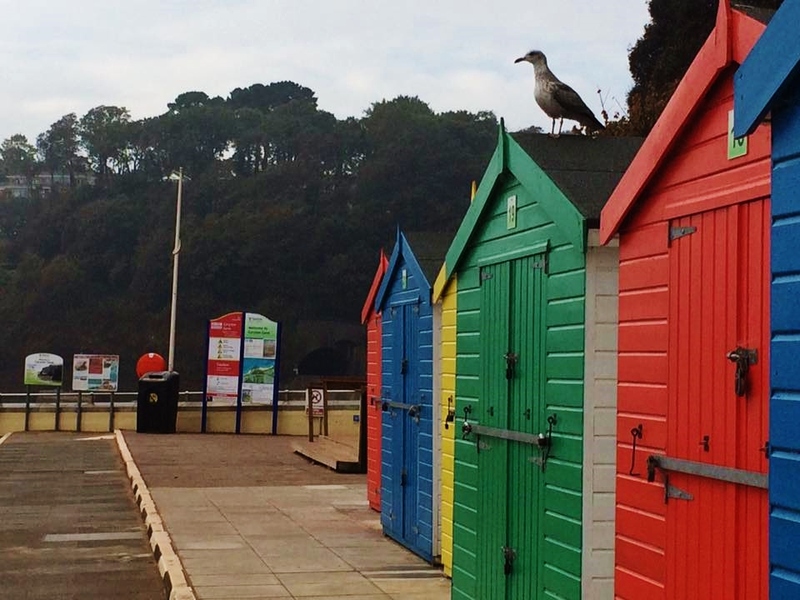 I arrived first and waited with a gull who was cheekily perched on top of a beach hut. The sea was not exactly attractive. It was brown and the beach was absolutely covered with sea weed, brought in by the persistent Easterlies. Of course once we were in, it was lovely, if a trifle bouncy, and we swam round towards the twin peaks - or 'horses' of Horse Cove, and Gilly showed us the extroardinary smugglers' tunnel half way up the cliff. Someone has even bothered to build brick stairs inside it. Sadly we didn't get a picture up close. Gilly was the only one who managed to climb up to the tunnel (I got nervous and chickened out) but was still getting to grips with her camera and didn't manage to get a shot. However she did manage to take a pic of me looking up at her from the beach! Meanwhile, a little research on the internet shows that there was an alarming cliff fall here back in 1885 in which three people died. A disturbing thought, and of course the cliffs are still very unstable today. We'd put a Burgh Island circumnavigation in the diary for October, hoping against hope that the conditions would be right. With persistent strong Easterlies up to the day (9 October) I wasn't optimistic. But amazingly, the weather came good. The sun was out at Bigbury-on-Sea and we kept marvelling at how warm it was. We started our swim about half an hour before high water, and the conditions were simply perfect. The sea was clear and calm, and we went round anti-clockwise. The swim through the big cut-through gully at the back was simply stunning. The sun glinted off the stark sides of the chasm, and I looked down to the stripy rocky sea bed below. Then, to top it all, we saw a starfish. Exhilarating. Having completed part 1 of the Dart Slither earlier this summer - between Dartmeet and New Bridge - it was time to attempt Part the Second. And so bright and early one Sunday morning Anna, Rachel, Judy, Ellie and I slipped in under the majestic arches of New Bridge, ready to swim, slide and slither down the Holne Chase section of the Dart, to the weir below Holne Bridge. The river runs mostly through private land, so we were setting off into virgin territory. The first bit - Spitchwick - was familiar, and enlivened by some great mushroom spotting from the water, of some splendid Penny Bun specimens (which we returned later on to pick). Then, past Buckland Bridge, we started getting into waters new. The river ran over a series of stickles - this, according to the writer Eric Hemery, is a Dartmoor word for rapids - and then opened out and we passed a fishing lodge, complete with antlers around the door. We then came across a cascade, which I believe the canoeists call "The Washing Machine" where we braced ourselves against the water and got head massages. Then we passed under Lovers' Leap - a spectacular cliff, where, legend has it, Wilfred, a young monk from Buckfast Abbey, jumped to his death along with his lover Rosine. It was a relief to get to Holne Bridge, where the river is deep all the way down to the weir; we were carried along gently by the current and emerged on the bank, four hours after we started.